Fifty-year-old Sarah Medad Westwood died this date, April 5th, in 1853 of a stroke (Apoplexy) and was buried at Bethel Burying Ground. Her spouse, Keeling Westwood, worked as a confectioner earning $30 a month. A confectioner was a person selling and/or making candy or other sweets. Ms. Westwood was employed as a “baker,” according to the 1847 Philadelphia African American Census. It appears that one of the older children worked in a store for $4 a week which was a good wage. It appears from that Census that the Westwoods had four children, two of whom were younger than two-years of age and two of whom were between two to fifteen years of age. Three were attending the Shiloh Baptist Church Infant School at South and Clifton Streets, now far from the Westwood home in Osborn’s Court, near 8th and Spruce. The photograph below is what the church infant school looks like currently. It is now an African Methodist Episcopal Church. The Westwoods lived on a narrow back alley in one room for which they paid $2-$4 a week. Osborn’s Court was typical for the era with the water spigot and privy outdoors. Street cleaning was infrequent, if at all, and, consequently, trash, garbage, ash and animal waste would form piles that would block gutters and force rainwater back in the cellars. Interestingly, Osborn’s Court had a long history of one of the more notorious houses of prostitution in that area of the city. There are numerous newspaper reports over the era of brawls between the ladies and their clients. The more violent encounters were between the ladies themselves. All this in the shadow of a large Protestant Church! Osborn’s Court ran behind St. Andrew’s Protestant Episcopal Church at 250 S. 8th Street. 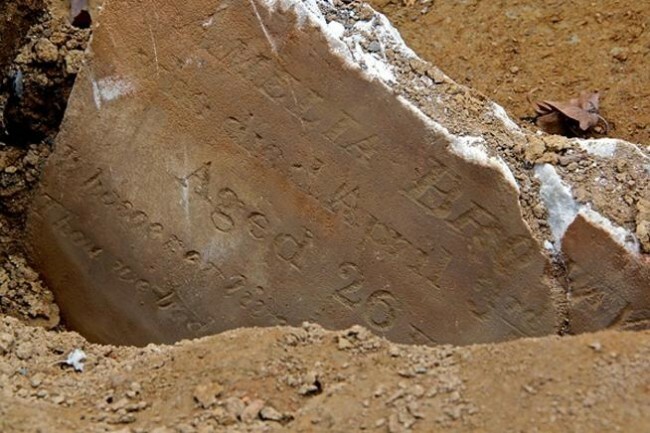 ← Thirty-five-year-old Sarah Golden died this date, April 30th, in 1853 and was buried at Bethel Burying Ground.